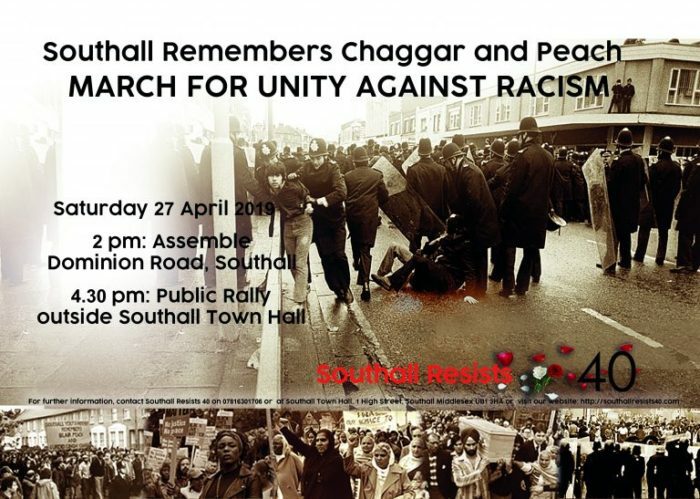 In April, and beyond, this year, the communities of Southall and people from afar will honour the memories of Gurdip Singh Chaggar and Blair Peach. Both were killed in the locality by violence dictated by racism. Gurdip Singh Chaggar, a young Asian boy, was an innocent victim of a racially motivated attack on 4 June during the hot summer of 1976. His untimely and senseless death galvanised young Asian people nationally to create their own political culture of self-organisation and self-defence as well as new artistic movements. Blair Peach, an anti-racist schoolteacher, was killed on St Georges Day (23rd April) in the spring of 1979 by the Metropolitan Police’s Special Patrol Group. This occurred during a peaceful anti National Front demonstration. No one has ever been arrested or charged, for his murder. His brutal murder inspired an international campaign for justice led by his partner, Celia Stubbs, and friends. Police actions on the day also led to the criminalisation of a whole community – mainly people of Asian and African Caribbean origin. Despite these tragedies, our continued resistance achieved a remarkable and life changing victory. People in Southall finally began to live and thrive in a town free from racist and fascist violence. Today the giant twins of racism and poverty fuelled by the far right have made a resurgence. In some parts of Europe, extreme-right and anti-immigration parties have become partners in government. Their strategy include strengthening forces of nativism and fascism in the UK. Death and criminalisation motivated by racism remains a potent mixture of lived experience. The signs are there to be seen. Do we need a weather presenter to tell us which way the wind is blowing? A locally led coordinating group, Southall Resists 40 has been established to plan events commemorating 1976 onwards. Our aim is not only to remember the past by learning lessons from the resistance that was created but also to prepare for the future.